A splash into the 50s, between colors and sounds a remind of italian glorious period with a holiday spirit in Lena Hoschek creations. This summer collection mixes patterns and geometries in a very spontaneous and genuine way that give to the whole ensemble a light feeling of party. When Lena Hoschek launched her own label in 2006, she was only 24 years old. Today, only five years later, the Austrian designer has already established an international reputation. 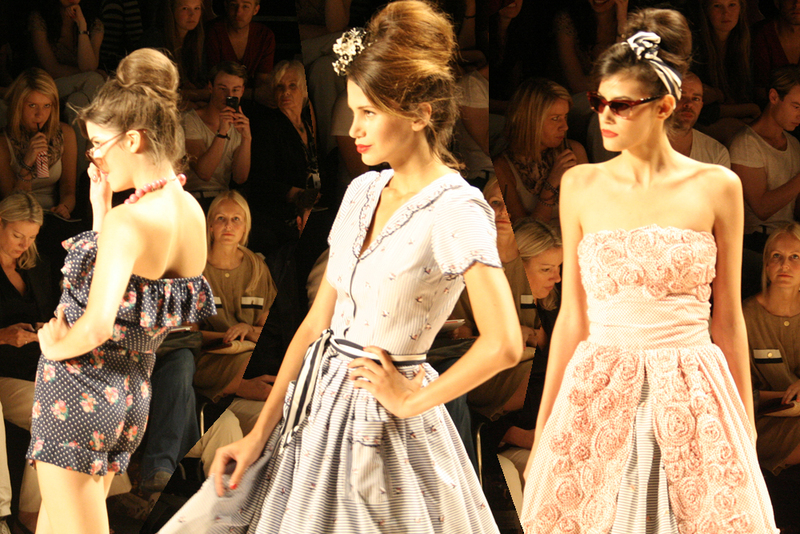 For the fifth time now she presents her collections at Mercedes-Benz Fashion Week Berlin. The Lena Hoschek Look is highly distinctive and clearly far from the dictates of fast-changing trends. Lena Hoschek’s Spring/Summer collection 2012 radiates the pure lust of life. Inspired by Italian folklore and the blazing femininity of women like Gina Lollobrigida or Sophia Loren. Bright colored embroidery, braided straps and black lace give the skirts and dresses a touch of nostalgia, while evoking a southern charm. Although Lena Hoschek stays true to the feminine silhouette of the 50s, this season she astonishes with strong color contrasts and voluminous, long dresses.